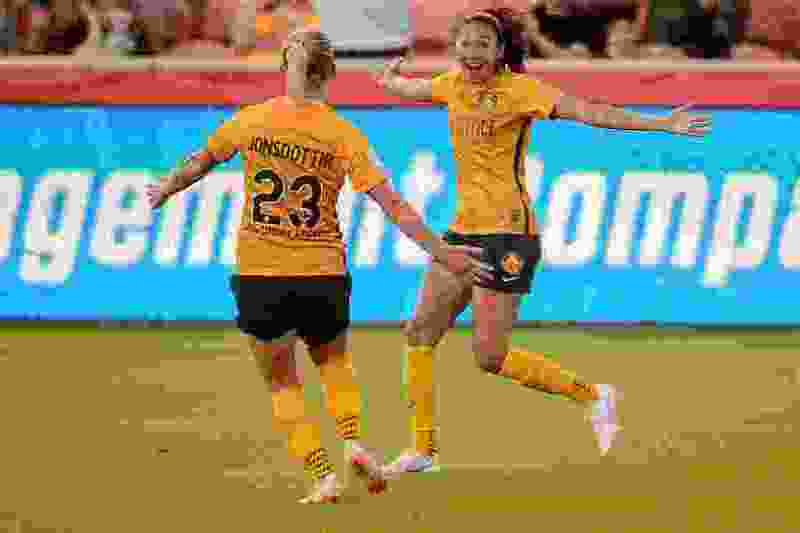 (Trent Nelson | The Salt Lake Tribune) Utah Royals FC's Christen Press (21) celebrates a goal with Utah Royals FC midfielder Gunnhildur Jónsdóttir (23) as the Utah Royals host Sky Blue FC at Rio Tinto Stadium in Sandy, Saturday June 30, 2018. Sandy • There’s no guidebook for an expansion franchise, let alone one with the loftiest of expectations in its first year of existence. So much of the experience, as Utah Royals FC have found out, is just rolling with it, making the most of the good and learning from the early missteps along the way. But what Laura Harvey knew when she walked out of the stuffed Providence Park in Portland, Ore., last Friday night was this: That wasn’t her team. That wasn’t what this organization was going to stand for, a 4-0 drubbing to a rival. The Royals head coach asked for a response in the second portion of the Pacific Northwest two-game trip, and she felt she got it, despite the 1-0 loss in Seattle — her old stomping grounds — on Wednesday evening. “Glimpses,” which can be construed two ways: That the Royals are close to bursting down the door of their own potential and announcing themselves to the NWSL with emphasis in the final two months of the 2018 regular season. Or, they will stay in search of themselves in Year 1, never fully capturing what could’ve been. Luckily for the Royals, there’s plenty of time. A total of five points currently separate the five clubs vying for the third and fourth spots in the NWSL standings. A top-four spot gets you into the postseason, a chance to hoist the NWSL crown. Utah has four of its next five matches at home, starting Saturday evening against Alex Morgan, Sydney Leroux and the Orlando Pride. Kickoff • Saturday, 5 p.m.
About the Pride • Orlando will be missing Brazilian superstar Marta who was shown a straight red card in the 3–1 loss to Houston this week. … Sydeny Leroux leads the team in goals scored with six and total shots (43). .... Leroux has scored in back-to-back matches for the Pride. … Orlando’s 25 points are tied for third place in the NWSL standings with Chicago. About the Royals • Utah will be without captain Becky Sauerbrunn (left tibial stress reaction) who left the 1–0 loss at Seattle. … Saurebrunn leads the NWSL in passing accuracy (84.7 percent) in 2018. … Defender Kelly O’Hara remains out with a hamstring injury. … Center back Samantha Johnson is unavailable due to yellow card accumulation suspension. … Midfielder Diana Matheson is back after serving a one-game suspension. It’s prep, too. The next two months will basically be weekly playoff matches — just not in the playoffs. A win against a team chasing or fending off will go quite far in the standings. Harvey said the reason for the league’s parity is due to the dispersal draft of the now-defunct Boston Breakers, making the NWSL that much more competitive. The same should be said about the Royals attack. Sitting in sixth place and four points behind Orlando and Chicago for the third and fourth playoff spots, Utah has found it a struggle to put the ball in the back of the net throughout its first year campaign. The Royals have 13 goals in 16 matches and have been shutout in four of their last five outings. If the Royals are to turn the tide and make the playoff push expected of them, they’ll need to reverse that trend. The acquisition of U.S. national team star Christen Press last month helps, but as Rodriguez notes, it’s not just on one player.